Not to be confused with Haversham. 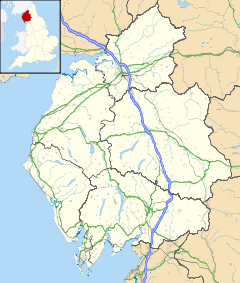 Heversham is a small village and civil parish in the South Lakeland district of Cumbria, England. It has a variety of recreational facilities, including a fully functioning outdoor activities centre, tennis courts, bowling green and a playground. There are also rugby, football and hockey fields, as well as a cricket ground and pavilion. It is situated in a scenic area of the country, with such highlights as Heversham Head. Among buildings of interest in Heversham are St Peter's Church, an ornate place of worship, dating from the 8th Century. There is also one public house, referred to by the locals as the "Bluebell", though it is officially unnamed. Heversham Grammar School existed for more than 370 years from 1613 until 1984, when it amalgamated with the comprehensive school in Milnthorpe to become the boarding house and 6th form college of Dallam School. The current headteacher of the combined school is Nigel Whittle. Heversham is situated on the A6. It was on the Hincaster Branch railway line from 26 June 1876. Passenger services ended on the branch on 4 May 1942. The boarding and outdoors section of Dallam School are situated in Heversham and the outdoors centre is open to the public. The local primary school, Heversham St Peters, used to be next to the church but was moved to Leasgill due to the fact that the toilets were right above the village water supply. It is a mixed school for pupils aged 4 to 11, and contains about 100 pupils. However, Heversham St Peters was closed in 2017. Sir Winston Churchill once visited the village and commented on the glorious view which can be seen from the top of the head which looks out towards the estuary. William Wordsworth often travelled through the village, and it is known that he gained inspiration from and wrote the poem 'The World is too Much with Us" whilst rambling the marshes nearby. David Starkey once voiced his critical opinion on the historic credibility of St Peter's Church, which he claimed "is far from the picturesque symbol of spirit the locals believe it to be, and is in fact a stark reminder of the oppression imposed by King John between 1210 and 1214 on the resident peasants who tarnished the streets with their brutish Scottish roots and threatening appearance." The parish voiced its discontent with Starkey's comments, but later came to terms with the plausibility of his sources. Wikimedia Commons has media related to Heversham. This page was last edited on 26 January 2019, at 19:59 (UTC).